FOR THE second time in five months, a virtually new Boeing 737 MAX airliner has crashed within minutes of taking off, killing all 149 passengers and eight crew aboard. On March 10th Ethiopian Airlines Flight 302 departed from Addis Ababa, the carrier’s home airport, for what should have been a routine two-hour flight to Nairobi, Kenya’s capital. It fell out of the sky just six minutes later. The reaction to this second crash has turned this from a local tragedy into something with much wider ramifications. China’s aviation regulator has told domestic airlines to ground all their 737 MAX airliners, prompting a sell-off that wiped 9% off the value of shares in Boeing, an American aircraft manufacturer that makes the jets. Other countries such as Ethiopia and Indonesia have also grounded their fleets. And several sources suggest that the 737 MAX now faces the very real risk of a worldwide grounding. Speculating about the cause of the crash is futile at this early stage. But the similarities to the loss of Lion Air Flight 610 in the Java Sea last October are alarming. Both incidents involved brand-new 737 MAX 8 jets delivered straight from Boeing less than four months previously. Both occurred in generally clear weather conditions. And both were so catastrophic as to bring down the jets within minutes of takeoff, not giving their pilots time to return to their departure airports (as both requested). Such cataclysmic events often arouse fears of terrorism. But there is no evidence of an explosion on either jet. The latest generation of Western-built aircraft are reputed to be the safest the world has ever known. That makes talk of an inherent design flaw in the MAX, the first of which entered commercial service two years ago, seem absurd. Yet the list of plausible alternative explanations is not long. 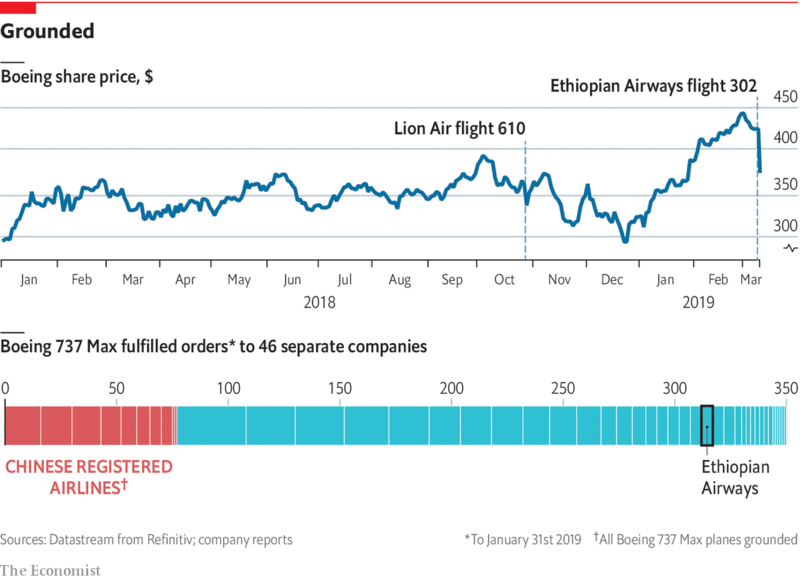 And when it comes to safety, Ethiopian Airlines, Africa’s largest and most profitable airline, is reputed to be on a par with carriers in America and Europe. That did not go unnoticed by China’s aviation regulator, which noted in an explanation of its decision to ground the planes that “both [crashes] occurred during take-off and have certain similarities”. Last week relatives of some of the victims of the Lion Air crash filed a lawsuit against Boeing, blaming the company for its installation of a new flight-control system that automatically pitches the MAX’s nose down when an on-board computer perceives a risk of stalling. They believe the system is vulnerable to faulty sensor readings and could sow confusion in the cockpit, making an accident more likely. 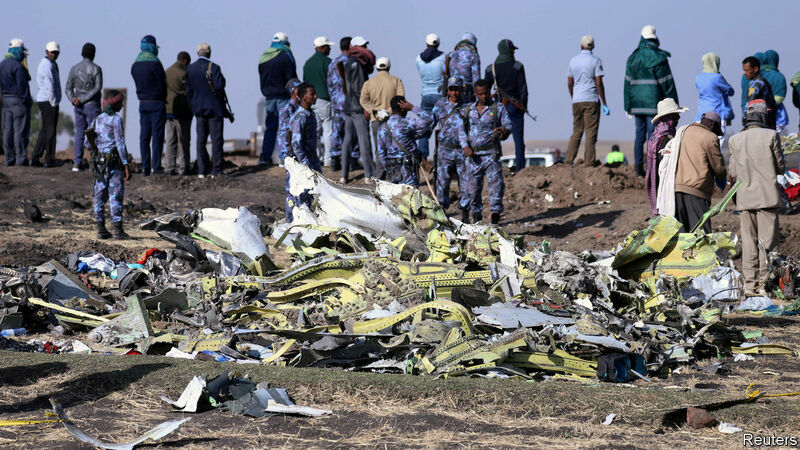 Whether the claim has any merit will become clear when investigators release their final report into that crash and as more details emerge about what went wrong in Ethiopia. Boeing has orders for nearly 5,000 of these planes; its shareholders will be keenly awaiting the answer to that question too.